COMMISSIONS - For commissioned / custom paintings please connect with me and I will be happy to help you create your perfect masterpiece . DIGITAL MOCKUPS - For more complexed designs I can provide a "digital mockups" to help visualize our ideas. PRICES - Commissions are priced depending on the size and complexity of the oil painting. Normally I ask for a 50% deposit and the balance before shipping though payment plans are available with in reasonable time period. PAYMENT PROGRAMS - Are offered to spread out payments and ship the painting when the balance is paid. PAYMENTS - A special PayPal link will be sent to you by me or for a discount you may send a check to my PO Box 9361 Huntsville, Tx 77340. 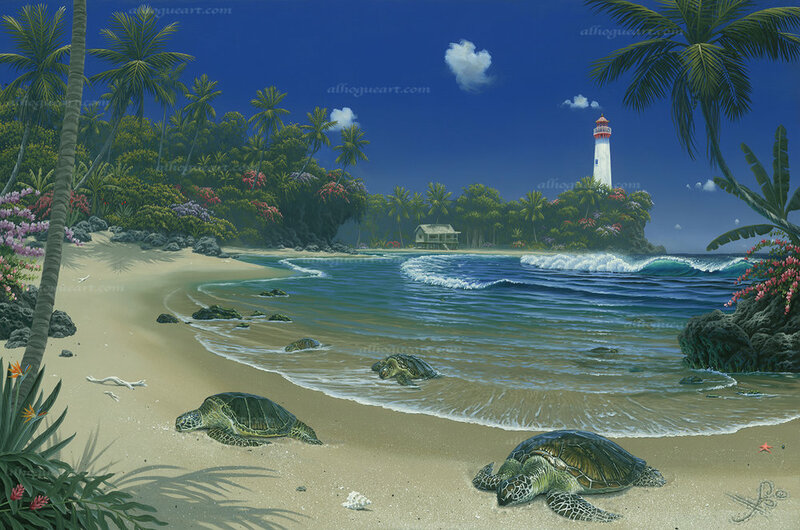 "Turtle Bay" DIGITAL MOCKUP done for the Brewster's prior to the start of their commission. "Classic Sunset" 20"x24"was commissioned by KEELS & WHEELS at the Lakewood Yacht Club in Seabrook, Texas for the 2017 cover of their 22nd annual antique car and boat show magazine. 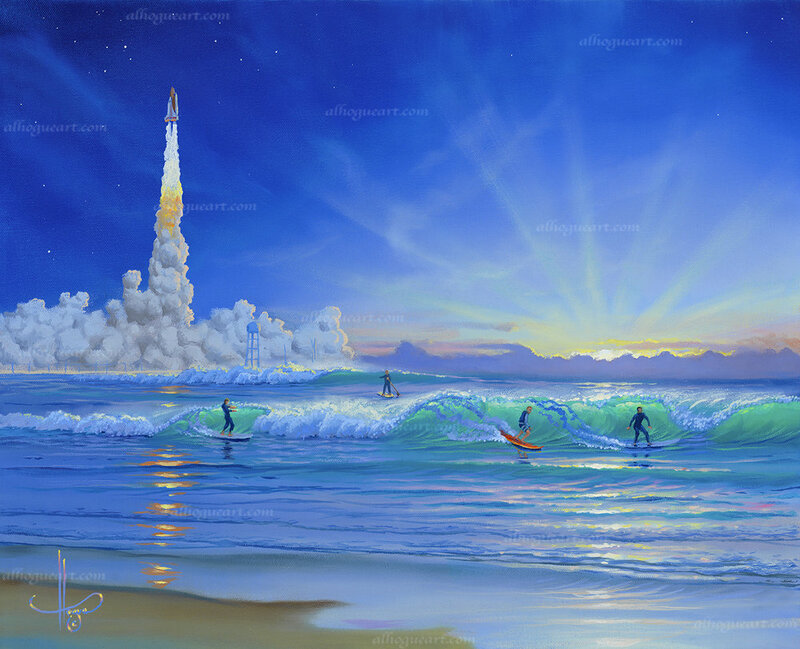 "Second Light" 16"x20" oil painting commissioned by a veteran of the aerospace program in Cape Canaveral Florida. The light from the exhaust plum of the space shuttles main engines and solid rocket boosters was referred to as the light for humans to explore into space, the second light being after the Apollo moon rocket program ended. This beach where he surfs is called the second light. Mockup completed before the start of the painting. 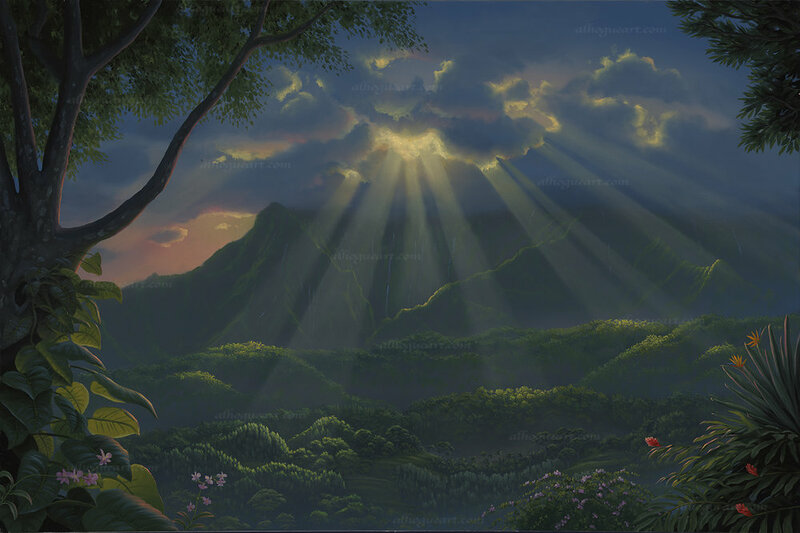 "Kauai Paradise" 24"x36" oil painting commissioned by the Outcalt family to be able to enjoy daily their favorite place on the island of Kauai in Hawaii. "Moonlit Symphony" 24"x30" oil painting commissioned by the Shinn family. "Manatee's 24"x30" oil painting commissioned by This painting was commissioned by Al Hogue collectors, Bob & Laurie Shinn. The scene is inspired by both the, Shinn's and Al's love of Jimmy Buffet's music and their mutual love of the Florida Keys. In the background we see the float plane Jimmy Buffet uses to explore the countless islands of his Florida Keys. In the foreground we see Jimmy's parrot in the mangrove tree and the rare Florida Manatees swimming in the crystal clear Caribbean Sea. "Old mill Trace" 24"x30" oil painting commissioned by the shinn family, this was a historical site where they live in IL. They wanted their 2 dogs in the painting also. 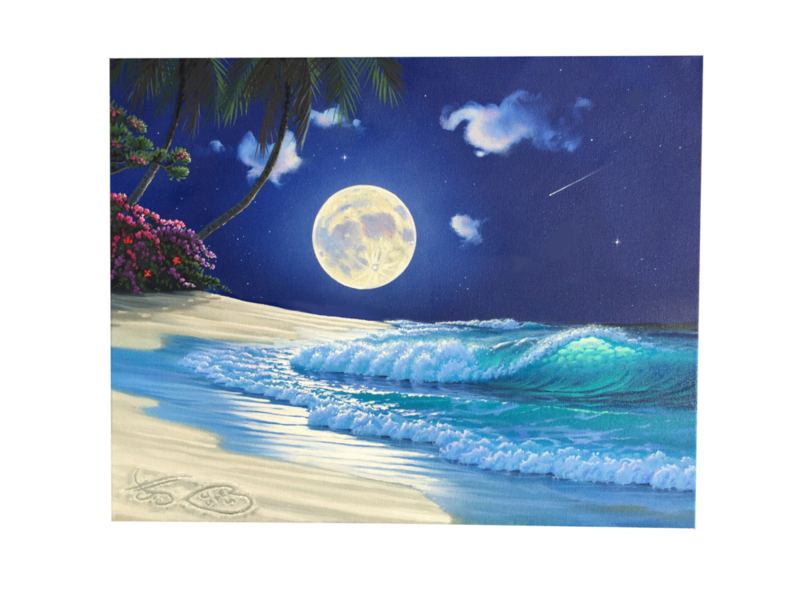 "Moonlit Islands" 20"x25" oil painting commissioned by the Onerheim family to remind he and his wife of their tropical adventures around the world. "Mermaid's" 20"x24" oil painting commissioned by the Petrovia family who wanted their mother and daughter as Mermaids together. "Kauai Moonrise" 24"x30" oil painting was commissioned by the Nagota family in Tokyo Japan to remind them of their vacations to Bali Hai on the island of Kauai in Hawaii.